Larger and lighter than before plus it rides well. More rear legroom and a big boot. Affordable prices particularly alongside the competition. 1.5 Turbo petrol engine is very good. Interior material quality isn't great. Pretty dull to drive. 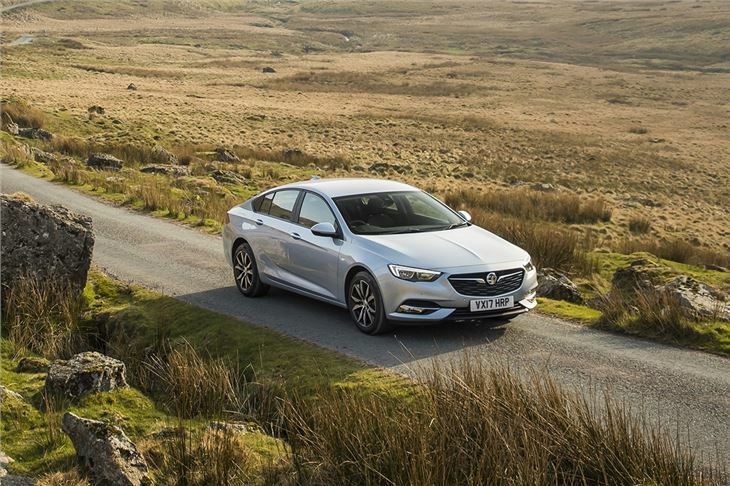 While it may have a posh new name - although we're sure it won't take long at all for everyone to drop the 'Grand Sport' bit - there's actually a lot more to this generation of the Insignia than meets the eye. It would be easy to dismiss this as just another drab Vauxhall hatch that will be the default choice for many a company car driver, but it actually has quite a lot of appeal - not least because of what good value for money it is. Compared to similar family cars - such as the Skoda Superb - it's very competitively priced. The entry-level model is £17,000 and that gets you a very comfortable, spacious and reasonably well-equipped car. In fact even at that money you're getting air conditioning, cruise control, a seven-inch colour touchscreen, electric mirrors, DAB radio, Bluetooth and things like Apple CarPlay and Android Auto. The entry-level 1.5-litre Turbo engine is a good one too - it has enough get up and go for everyday driving and is reasonably economical too. The other thing the Insignia Grand Sport majors in is space. It's not far off five metres long and bigger than the aforementioned Superb. This means it has acres of space in the back, a huge boot and is extremely comfortable too. Along with smaller turbocharged petrols, there are of course diesel engines, with the 1.6 CDTi, the same engine used in the Astra, providing the best economy with the official figures suggesting more than 70mpg. It's not particularly engaging to drive, but it's an easy car to get on with thanks to excellent seats and a simple cabin layout. There are a few question marks over the quality of the finish and the durability, but overall, this represents a lot of family car for the money.